New powers to patent animals (including unrealized hybrids that populate furry fiction) burst into the news on 11/13/13, when activist organization Wikileaks revealed a draft of the secret Trans-Pacific Partnership Agreement. Analysts have called it "a major power grab for large patent and copyright industries," with powerful implications for the future of intellectual property. You're walking through Central Park, and see some panhandlers begging for change. They're wearing badly made, unsightly costumes of Sesame Street characters. 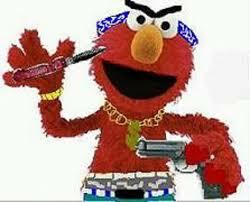 You shouldn't hang around them in fursuit, because a pimp Elmo might come smack you off his corner! After Sakura encountered the Central Park panhandlers, it inspired many questions about copyright. He asks: how does copyright work for fursuiters? Is copyright held by the suit builder, or the owner? How does it work for photography of the suit? Who can make money from these activities? Such questions aren't uncommon. I suspect that they're complicated enough to cause persistent confusion, like with laws to protect commercial properties that aren't worth enforcing for fan activities. Have we ever seen a furry copyright problem go to court? Have fan-made costumes of trademarked characters ever brought trouble to an event? Many makers won't build such costumes. Can any makers explain how they negotiate their terms for commissions? Are there any lawyers in the fandom who can give professional answers? 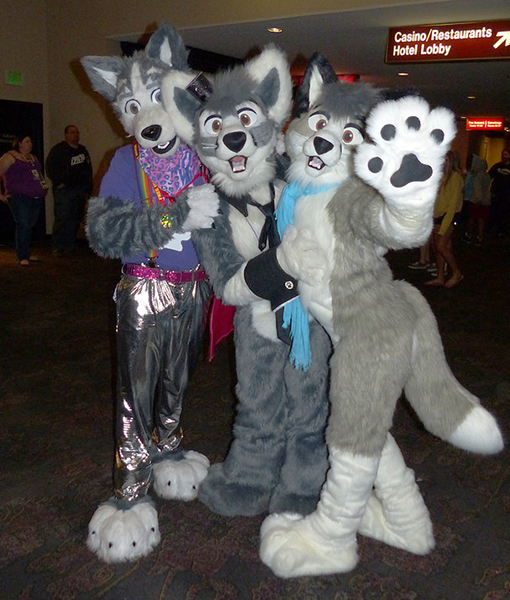 Sakura and Mercury let me join Secret Fox Club, at Biggest Little Fur Con 2013. Photo reproduction and "furmark" is brought up here by Kakurady. Another post on Artists Beware complains about unauthorized use of fursuiter photos for a documentary film. I'd like to toss out there that having worked with a local costume rental company that produced a lot of its own costumes for rent, and did theatrical work and design work as well (I'm an actor), the sort of 'magic number' that they used for costumes was '20% different'. Legal precedent has apparently gone in favor of the alleged trademark infringers if there is no 'company' logo or name and the costume is at least 20 percent different from the character in question. Fursuit.org attempts to address copyright with a legal FAQ that's unfortunately incomplete. A lack of common consensus and understanding seems to leave an open challenge to build a central resource to help. Subculture might be a better word than fandom, when furries do more than follow unoriginal creations. That's a good reason to build central resources, to support and promote fellow creators and members with questions like these. These issues seem likely to grow if fursuiting is trending in pop culture, raising the bar for it's craft, and increasing with the success of cons. I hope this kind of discussion will contribute to better resources. Others hope the same. Read more in this Reddit thread proposing a Fursuit maker review site. Many different creators organize to promote their specialities. It's not like a "multilateral free-trade treaty" between nations, but fursuit makers and furries should consider it too. Oh god, I really, and I mean REALLY don't want IP laws to get worse. The original meaning of Copyright had nothing to do with what people with Copyright now these days and Patents seems to destroy (along with Copyright) inventions, stifles creativity, etc. I been studying about the issues that people been having with the idea of "Intellectual" "Property"... The person's website about Nina Paley shares some very good information regarding the laws if anyone is interested. Note: When I said original meaning, I mean the current legal things are not much focus on it anymore. Let's hope for now, we don't much effect what people like to do in this "fandom", but yes this may be a good important issue at the moment. Just a bit worried..
Oh and by the way, I don't think you can "Copyright" characters them selves, seems like a Trademark issue (Which is supposed to stop people from fraud maybe), of course, the art work, and such is more Copyright I think. If a fursuit maker/owner sells a fursuit based on an original design, the buyer implicitly owns the copyright on the design unless it's explicitly stated otherwise in the sale. If a fursuit maker produces a commissioned fursuit, the buyer keeps the copyright on his design. Similarly, characters in commissioned artwork are typically owned by the buyer. Often the seller will distribute her own work despite this, but this seems to be commonly acceptable. Photographs of a performer are typically owned by the photographer. Distributing someone else's photo, video or artwork of your costume character without permission from the photographer or artist is technically a violation of copyright. In most situations online nobody really gives a crap about stealing photos/videos though, because the distribution is rarely meant to turn a profit (there are exceptions of course). But if money becomes involved you can expect someone to say something about it. This is why a TV show using footage of wildbilltx without asking (not to mention removing his watermark and giving him no credit) was considered to be unfairly infringing on his copyright, but derivative videos on YouTube that use clips hardly bat an eye. I've witnessed furries acuse another person of stealing their character design for their own fursuit or creative work. I've never seen the accusation hold up though, because in most cases the design is different enough that it's perfectly conceivable each design had been conceived independently. I'm not aware if any member of the furry fandom has ever attempted legal action or a C&D against someone else over a character design specifically, but I wouldn't be surprised if there have been similar disputes over artwork. I know my knowledge of this is limited so I'd be interested in seeing a more professional take on this. Unless you are actually signing a contract that says this is a work-for-hire, and that the buyer is also purchasing the rights to the drawn artwork/likeness, the copyright stays with the content creator. An exception is made for things where the characters are trademarked. It's got to be contractually stated that it is WORK FOR HIRE before it becomes a derivative works thing. Also, note, it's probably not a copyright violation to even copy someone's SUIT , per se, but if you did copy the patterns to create the suit, it might be. But that's not a violation of copyright for the SUIT, but for the pattern that made the suit. I think what would be required for the best protection of a fursuit design would be a design patent - the standard method for protecting artistic elements of a functional object. This would most likely be owned by the fursuit builder, since they might make several fursuits following the design of the patent and would probably like to avoid people making "lookalike suits" for less - for 14 years, anyway, in the U.S. There is a separate copyright issue relating to distinctive images or patterns depicted on the fur. This might be owned by the artist who created the art, but could be assigned to the owner of the character. This balance works out well because then the fursuit builder can't create more characters that have a pattern resembling the original, while the commissioner can't have someone else create a fursuit that have the exact same shape and features. Of course in reality people don't seem to do this, but they often act as if they had. How much do design patents cost? In the U.S., it could be as low as $45 to file. It looks like most fursuit building companies (or sole proprietors) would count as micro entites as they do not make three times the average household income ($153,051 as of September 2013). Married people are counted as individuals and qualify individually, not by totalling their income; each should figure out how income is theirs. They could file up to four patents at this fee, and then they would probably have to start paying $90 (as a small entity - fewer than 500 employees), unless they also qualified by merit of being primarily employed by an institution of higher education, or were assigning a license to them. Micro-entity and small entity patents must not be licensed to a non-qualifying entity, but I don't think making a suit for them counts. But wait: That's the filing fee! There are also search ($95), examination ($115) and issue fees ($140) - so it's more like $395. You also have to get proper design drawings done, so I'd figure on closer to $1000 once you're done with it all. Hasbro's relationship with bronies has been to retain extremely tight control over bronies, tell furry cons that they are okay with materials being traded / sold but absolutely _ZERO_ things directly from the show can be shown or heard (including fans SINGING the music), etc. There's a pretty common fear amongst con runners that the Brony thing will end soon. Forcefully. My impression is that the larger the fan project, the more resources being invested in it, and the more potential profit, the more likely Hasbro is to go after them to protect their trademark. For all the little stuff and small-business dealers who sell fan stuff, Hasbro can turn a legal "blind eye". Except if someone else contacts their legal department and says, "Hey, I saw this person making and selling MLP stuff," then they might also be more likely go after them, because they're no longer "blind" to their existence. On a similar note, a lot of authors have to ask their fans to stop talking... when the fans start telling them about these great story ideas they had! Because if the author uses one of the ideas (accidentally, subconsciously, etc.) they could get sued. It makes for a really weird situation where creators want to be able to interact with their fanbase, but can make for some weird dynamics, like completely avoiding fan fiction sites. When someone's pitching an idea, it's not uncommon for one side to insist on a non-disclosure agreement; or on the sneaky side, contests and web sites that contain small print that anything you share with them becomes their intellectual property, and that you waive all rights to the material. Of course, deniability and arguments can go on and on.